We are 4 episodes in to a new season of The Great British Bake Off and the kids are obsessed so we decided to set up our own Bake Off. For those of you who have no idea what I’m talking about, it’s a cooking competition on the BBC that features 12 bakers all tested in the Bake Off tent on their biscuits, tarts, breads and cakes. This most British of British television cooking series is hosted be the extremely funny Mel and Sue and judged by Mary Berry and Paul Hollywood. Charlotte and I were both Mary Berry and Paul Hollywood – and also Mel and Sue – and also the entire team of cleaners the show must have that you never see. That tent is always so neat and tidy – a far cry from my kitchen when the bakers were finished. 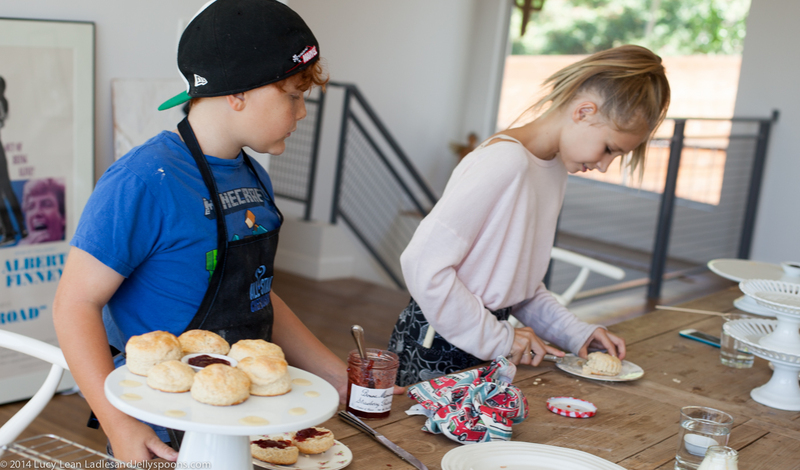 For our first Bake Off I decided to challenge the children with a hybrid of the signature and the technical bake – they would have to make 6 perfect scones using my recipe, in under an hour. In addition to following the recipe I laid out a selection of spices and flavors for the bakers to use if they wanted to. Having measured out the dry ingredients the three girls all decided to add the butter and make a ‘breadcrumbs’ mix by hand, whilst Rémy chose to use the food processor. The pressure of the challenge kept getting to Rémy who became so rude at one point he was asked to leave the tent for the naughty spot! Something I know Mary Berry would agree with and say “I think that’s sort of unacceptable.” After his time out Rémy returned to the kitchen where the bakers were debating what to add, if anything to their scones. 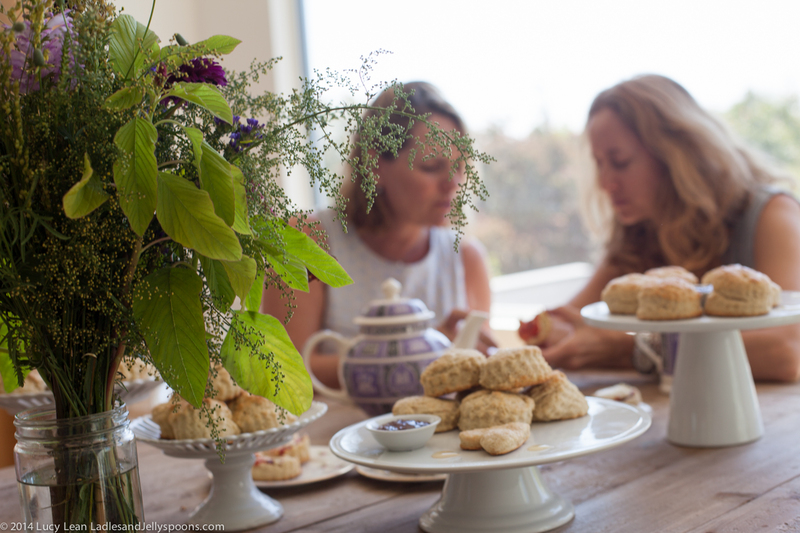 One decided to keep her scones traditional, whereas the others chose to get creative – one added vanilla extract and mixed spice the other added vanilla extract and dried lemon peel. Rémy added a teaspoon of mixed spice.The doughs were patted into shape and the scones cut out and then the bakers faced the choice of how to top their scones – egg wash, milk wash, vanilla, sugar or even lemon peel? Two bakers used a milk wash – which paid off – their baked scones looked the most delicious from the golden brown. One baker glazed her scones with a milk and vanilla mixture and then added sugar on top which didn’t give them a golden brown color and also added no additional flavor. The other baker chose to top her scones with more lemon peel which went dark brown in the oven and didn’t add flavor. The lack of a milk wash meant they weren’t golden brown. Into the oven went the scones and the attention turned to presentation – each baker chose and decorated a cake-stand. 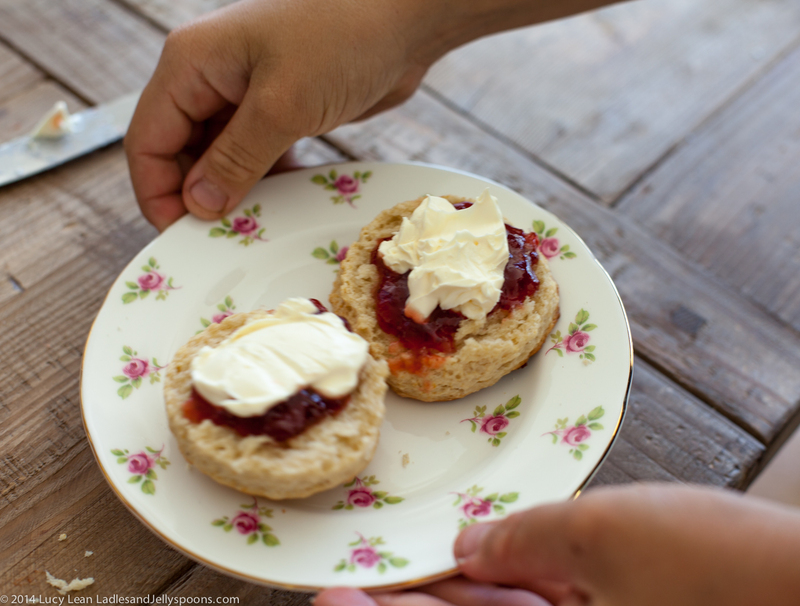 Once the scones were cooked and cooled they were plated, Devon clotted cream and strawberry jam topped them off and the judging began. It was so fascinating to see how the scones varied given that they had all followed the same recipe and taken about the same amount of time. 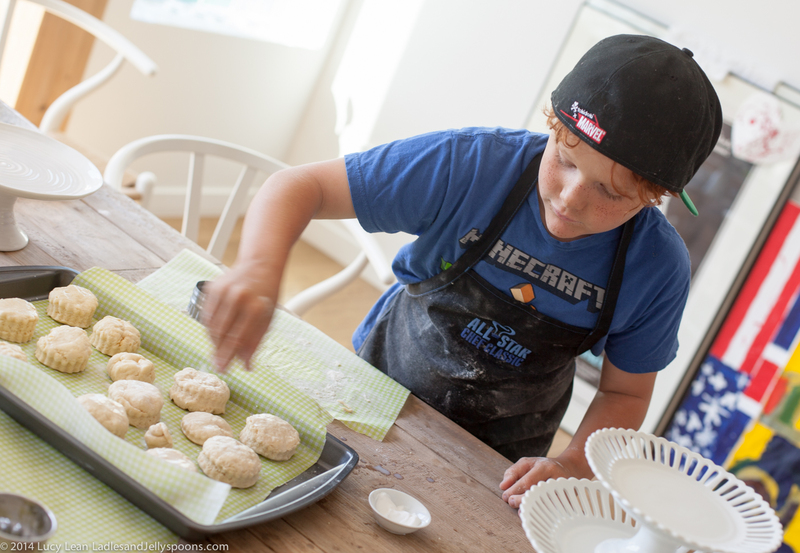 We all learned so much about what made the perfect scone – Rémy just missed out on Star Baker – his appalling attitude lost him the honor but below is his recipe. His decision to use the food processor definitely paid off. 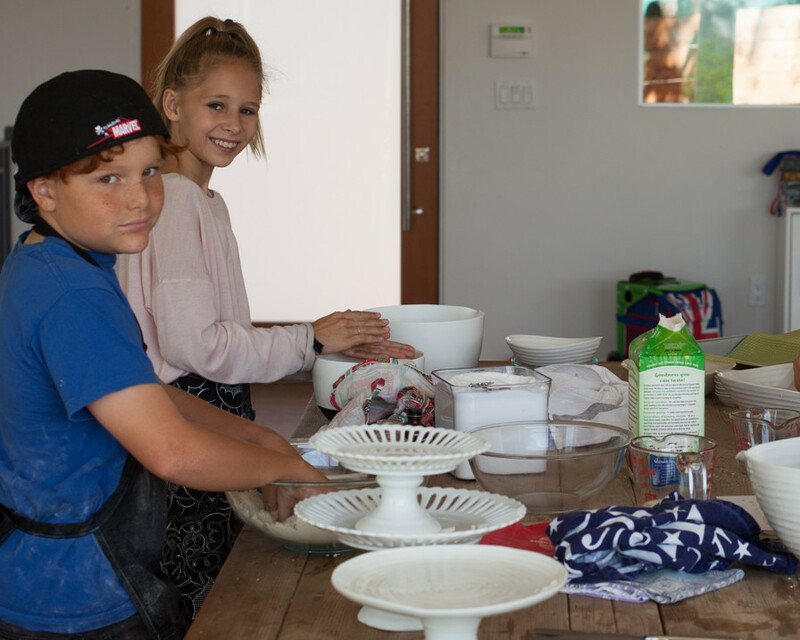 We will definitely do this again – next time we are thinking sugar cookies/biscuits or quick bread rolls and then for the holidays we are going to do a gingerbread house challenge. 1. Pre-heat the oven to 425 F. Line a baking sheet with parchment paper. 4. Add the sugar and mixed spice and mix in for 10 seconds. 5. Slowly pour in the milk through the top, as the processor is on high to form a soft dough. As soon as the dough comes together stop pouring in the milk. 6. Turn dough out onto a floured work surface and gentle pat into a round about 1 inch thick. Dip a small round cutter into some flour and then cut out scones and transfer to parchment paper lined baking sheet. When all the rounds are cut knead the dough together very gentle to cut out more scones, continue until all the dough is used up. 7. Brush the tops with milk. 8. Bake for 12 – 15 minutes until the scones have risen up and the tops are just turning golden brown. Serve with Devon clotted cream and strawberry jam.